← Is Your Elderly Loved One Worried about Exercising? What happens when a person is feeling overwhelmed with life? What if that person looks to family and friends, realizes there’s no one they can turn to, and that they’re truly on their own? That can feel completely devastating. The veteran or other individual can feel helpless, useless, and even frightened. 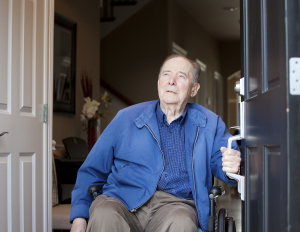 That’s not an enjoyable place in which to live, but when people need some type of help getting around because of an injury, disability, or diminished strength that’s the byproduct of aging, home care is a great option. Some veterans may face difficulties. Whether it’s a direct result of their time in service, their age, or injuries sustained long after they were discharged from service, some veterans may face various challenges in life. Some of these challenges can be emotional, mental, or physical. When they face these difficulties and do not have the right type of support on hand, it can make life feel daunting, overwhelming, or pointless. Many people have, at one time or another in their life, felt that pang of isolation and loneliness. It may have been only in their imagination, but it could have been real. So what can veterans do when they feel there are no options available for them? Even those veterans who understand the benefits of home care support services may not see it as a feasible option because of their limited income. That’s where the Aid and Attendance Benefit is so important. This pension is available to wartime veterans. What does it mean to be a wartime veteran? It means at least one day of active duty service needs to have overlapped a time of official combat. No, the veteran did not need to have served in a forward combat situation, but their time of service needs to have overlapped official combat by at least one day. For these wartime veterans, if they served at least 90 days active duty (a minimum of two years if they served any time during the Gulf War), and if they are limited in their income and assets and can prove home care is necessary, it can provide financial assistance to pay for at least some level of support. Even though some veterans may feel completely isolated and alone, as though there are no viable options available for them with regard to support, there is. Looking into the Aid and Attendance Benefit can provide them the support they need to stay active, safe, and maintain as high a quality of life as possible. For Home Care Services in Memphis TN, please contact the caring staff at Personal Care Services MidSouth today! This entry was posted in Home Care Memphis TN, Veterans Care and tagged Home Care Memphis TN. Bookmark the permalink.